The harp belongs to the family of polyphonic instruments which can produce several notes at the same time. It is a popular solo instrument but also very much praised as an accompaniment to other instruments, voice, and dance. It can be played by a soloist accompanied by an orchestra, or it can be part of the orchestra. The harp belongs to the family of plucked instruments; the sound is produced by plucking the strings with the fingers. It has many personalities due to its amazing range of sounds. The instrument must be held in your arms. Its notes can be delicate, resonant, or powerful. Learning begins on the Celtic harp which is a smaller instrument, before moving on to the larger harp equipped with pedals. These seven pedals are used to play the various alterations. The hand and finger position will remain the same. Whether you are a girl or a boy, you will be amazed at how quickly you get to play solo or group pieces with the harp. 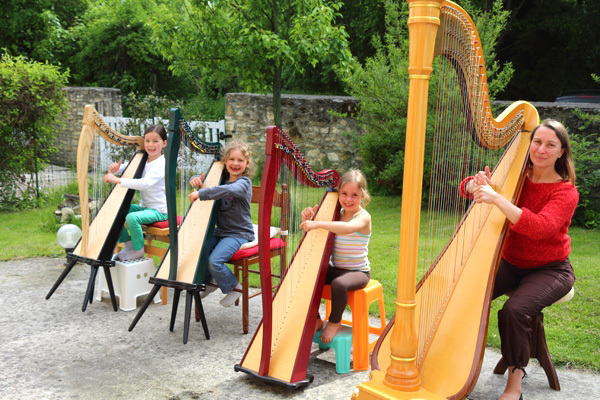 Harp classes are already numerous, especially in Italy, where a European Suzuki Convention of harp players will be held for the first time in 2014.